Triphylite is a mineral of phosphate pegmatites. The spectrum is dominated by a pair of Fe2+ bands in the near-infrared region. It also contains Mn2+ which shows up as a sharp feature near 410 nm. The relative values of the indices of refraction change with iron content, so the optical directions, alpha, beta and gamma, do not always correspond to the same crystallographic direction. The mineral shares the olivine structure. The spectrum is dominated in the near-infrared by Fe2+ in the site equivalent to the M(2) site of olivine. yellowish green triphylite spectrum; Center Stratford, New Hampshire, USA. Plotted as 0.05 mm thick. 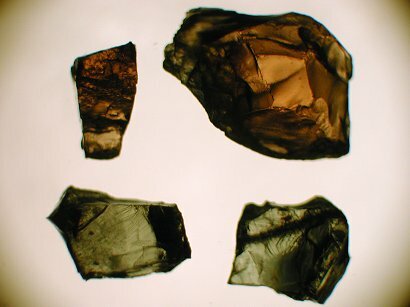 The indices of refraction of this crystal correspond to a crystal with 53 mole% Fe. Data File: alpha = c = 4.65 Å; beta = a = 5.97 Å; gamma = b = 10.3 Å.
Triphylite spectrum; Serra Branca pegmatite, Paraíba, Brazil. Plotted as 10.0 mm thick. Composition: X(Fe)=0.546. Data contributed by Michail N. Taran, Kiev, Ukraine. Data Files: a = 6.048 Å = beta; b = 10.337 Å = gamma; c = 4.704 Å = alpha.